No matter what career a student is considering, a “salary study” is a great idea. Here’s how to quickly do a salary study. Taking 20 years to repay: $1200 per month ($14,400 per year—$288,000 altogether). Taking the standard 10 years to repay: $1860 per month ($22,320 per year—$223,200 altogether). Taking 3 years to repay: $5097 per month ($61,164 per year—$183,492 altogether). According to the US Bureau of Labor Statistics, half of all veterinarians earned less than $88,770 per year in 2016. A shocking number of newly graduated veterinarians earned significantly less than this amount. Before you decide to become a veterinarian, make sure there’s no other career for you. In the writing and speaking I do, I strongly advocate that all students 10th grade and up take three specific career assessments to clarify a career goal that makes sense before they embark on any post-secondary education at all. I explain exactly how to do this in chapter 13 of my book. Education is too expensive to spend even one day plunging off in the wrong direction. As soon as you decide that vet school is definitely for you, become fully informed about the FAFSA form. You remember the FAFSA form from undergrad, right? This form is important because it’s the doorway to the best, lowest interest loans with the best possible terms. You’ll be filling out FAFSA again, every October 1st that there’s even a chance you’ll be in school the following year. I urge you to use every possible strategy to get as much financial benefit out of the FAFSA form as is legally allowed. I cover important FAFSA strategies that no one else is talking about in my book, on pages 102–113, 157, 199–200, 228–236, 239–247, and 249–250. For more help understanding financial aid for vet school, take a look at this helpful FAQ page provided by the College of Veterinary Medicine at The Ohio State University. If you’re determined to become a veterinarian, write one fantastic scholarship essay and use it to apply for every vet school scholarship you can find. You can find many, many vet school scholarship applications online by googling. For help writing one scholarship application essay that will knock the socks off of scholarship committees, get the 3-hour audio class you’ll find on my website, GetIntoMedSchool.com. To find the class, just click on GET HELP NOW and scroll down. You’ll find help there that will give you rockstar vet school applications and scholarship applications. Be sure to continue applying for scholarships every year, all the way through vet school. Parents, beware cosigning student loans. If your college-age son or daughter asks you to cosign on a massive grad school debt, stop in your tracks and read the article I’ve written here before you open your mouth to say yes. Students looking at veterinary medicine, read this book by Dr. Pete Freyburger. Check out the 67 Amazon reviews for Dr. Freyburger’s book Vetting: The Making of a Veterinarian. 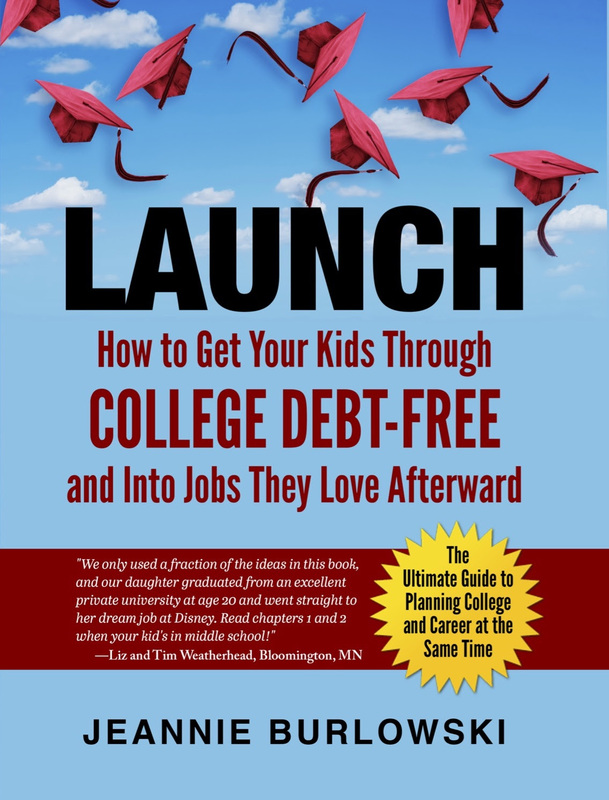 Parents, read just one chapter of LAUNCH every 1-3 months while your younger children are in middle school and high school, and you’ll know every viable strategy for debt-free college at exactly the right time to implement it. And if your youngest child is already well past middle school? That’s OK; you can run to catch up. But the process of getting your kids through college debt-free goes more smoothly the earlier you start it—especially if you’re not planning to save up any money to pay for college or grad school. Do you have friends who are parenting kids ages 16-28? Many of them love animals and think that life as a veterinarian would be a dream come true. SHARE this post on Facebook, Twitter, and LinkedIn right now. What experience do you have with vet school debt? 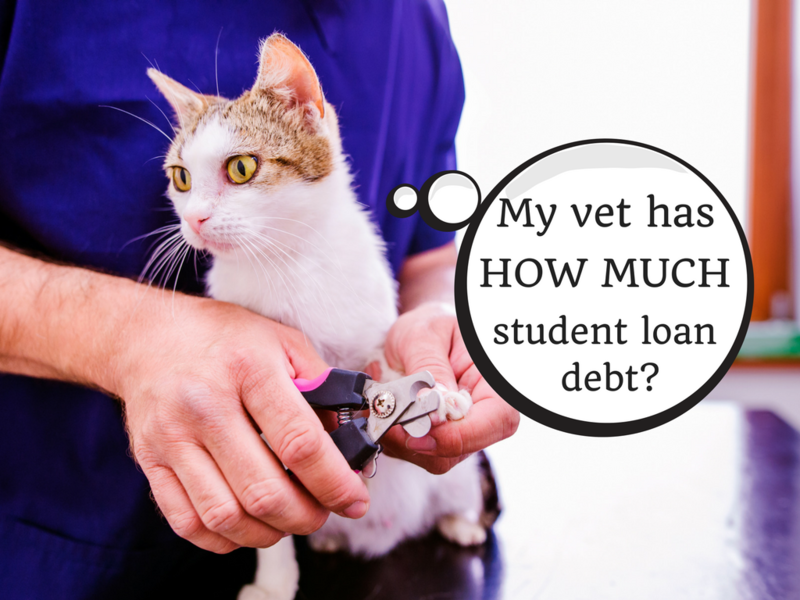 What have you found that vets can do to keep debt low and income high? What would you advise others about vet school debt? Comment below or LIKE Jeannie Burlowski Author on Facebook, find this post on that page, and let’s talk about it there.